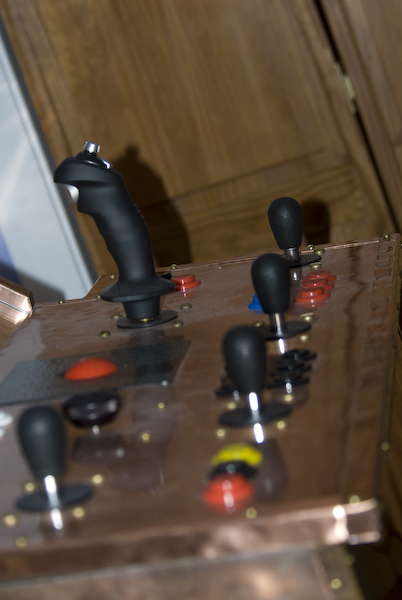 A couple years ago I started a project to convert an old arcade machine into a multi-arcade machine running MAME. Plenty of people have done this; there is even a book written about it. However, I wanted to try to take a unique approach to the project. 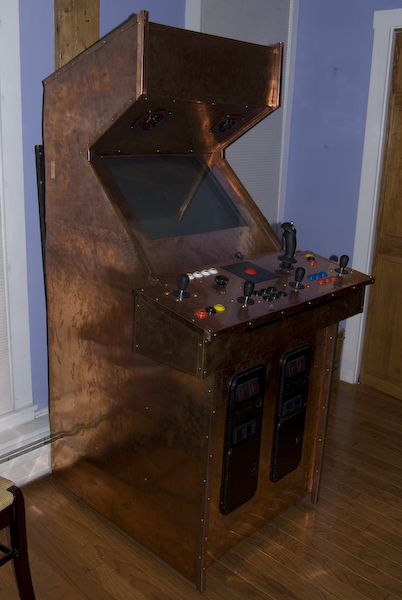 Rather than try to duplicate the look of an arcade machine from the 1980's, I thought of trying to make something that might be what an arcade machine would look like were it built back in the age of steam powered machines of the 1880s. 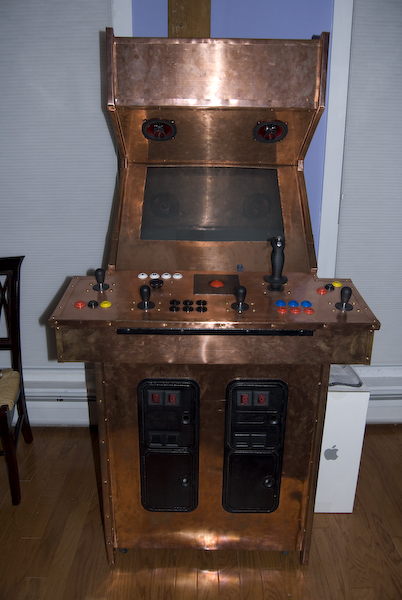 So, I bought a used arcade cabinet, gutted it, put a 27" TV inside along with a PC, built a custom control panel, and then covered the whole exterior with copper sheeting and brass screws. The only problem was I never quite finished it. 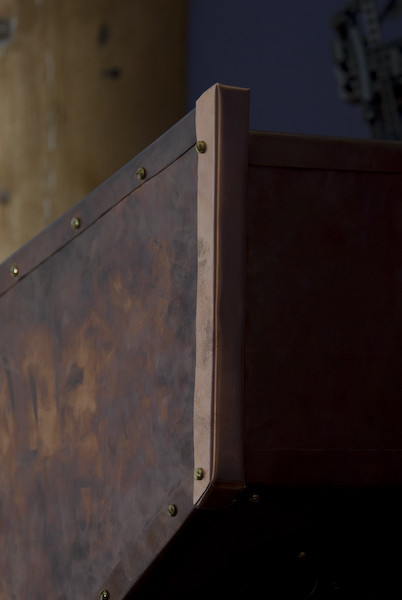 As I came to learn, cutting copper sheet metal, bending it into the proper shapes and drilling holes in it for the brass screws is a very time consuming process. So, while the project was about 90% complete, there were some tricky pieces of trim that I had just run out of motivation to work on - up until today. I figured I should finish off this project and today was a good day to do it. There are torrential rains, high winds, and it is just plain nasty outside. What better day to stay indoors and bend and cut pieces of metal? So, after a few hours of work, I am happy to say the machine is now complete. Here are some pictures from this last phase of the project. I used a cardboard template first as a proof of concept to make sure the folding of the metal was going to work properly. The following are the tools I used. 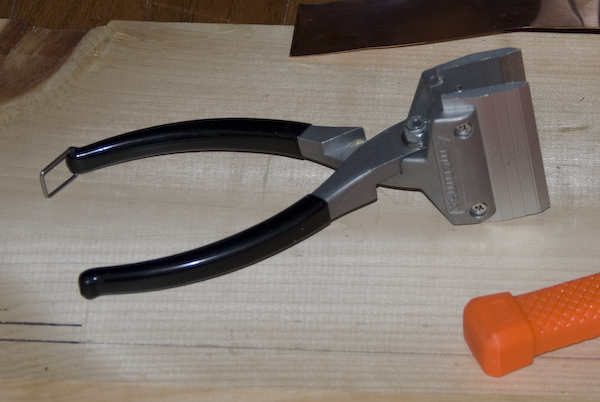 This first picture is of a simple tool for flattening and bending metal. 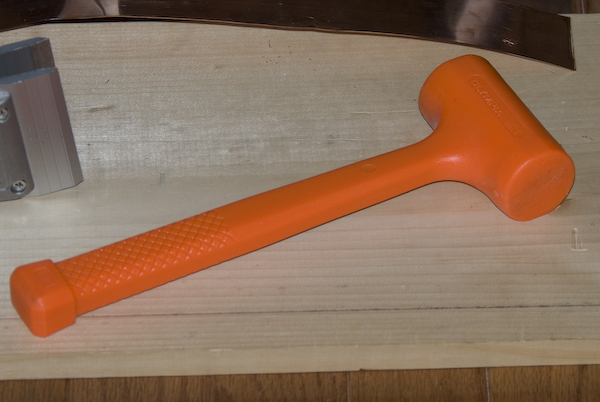 A dead-blow plastic hammer (filled with lead pellets) - useful for bending metal. 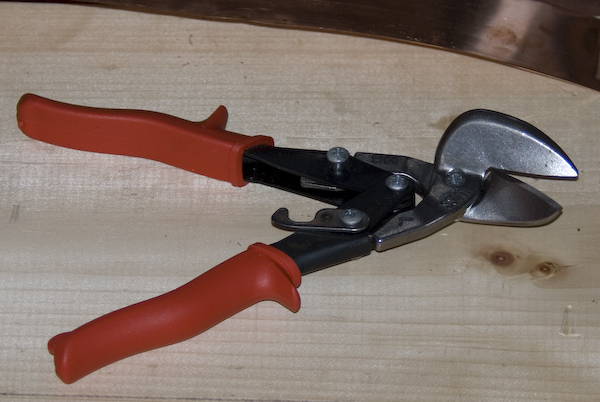 Metal snips - for cutting the copper sheeting. 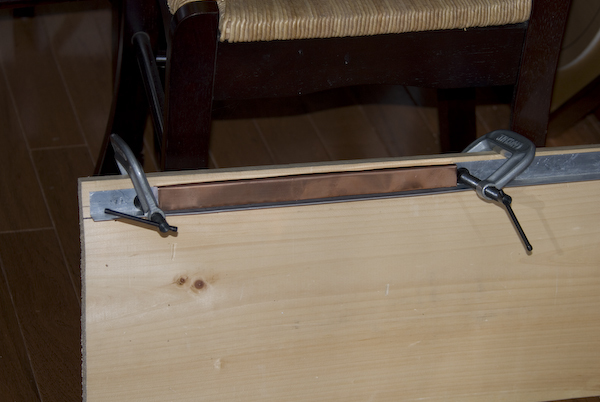 An improvised vise (made of C-clamps, an L shaped strip of aluminum, and a pine board) for bending long lengths of copper. 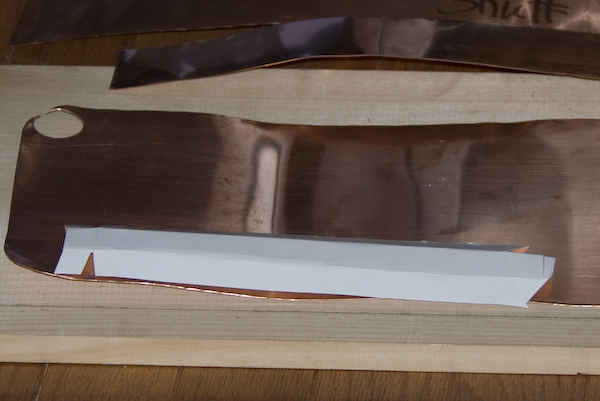 Here you can see a piece of copper sheet bent into a C shape. This is a close-up of one of the more tricky cuts and bends - it was an odd angled junction - kinda looks like a butterfly when flattened out. I like how it finally looks with the screws. 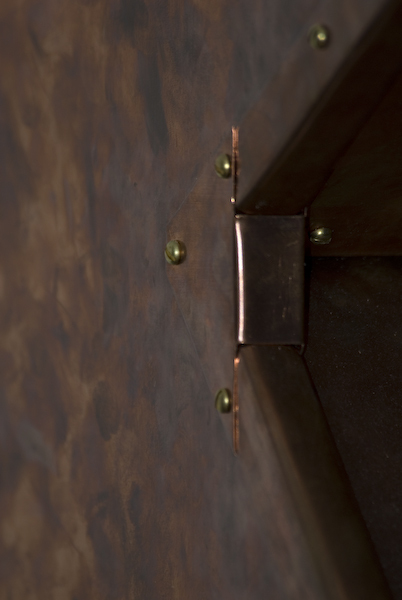 This is a simple strip of copper used to cover the seam where two larger sheets of copper met. 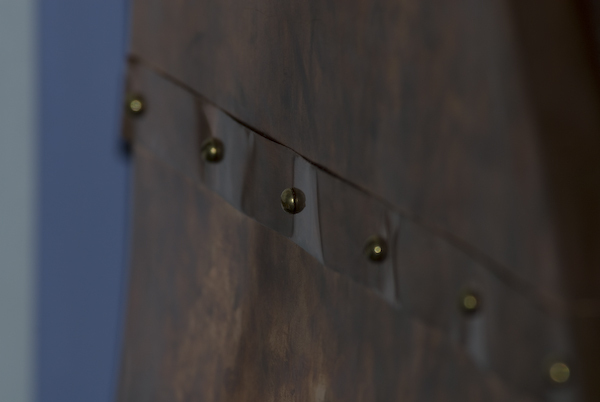 The brass screws were meant to give it a rivet-look. 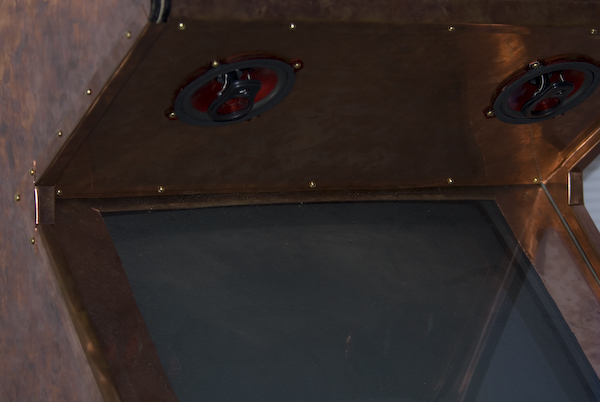 The next three pictures show the control panel. Ideally, I'd like to replace the colored buttons with black ones. The colored ones don't really fit the old steam-age theme. Originally, I wanted to use metal buttons - I even bought some metal drawer knobs to test out, but it didn't work out very well. 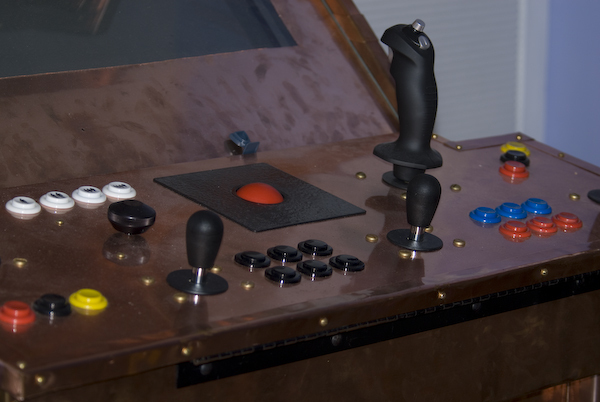 The arcade buttons get really hammered on when people are playing games, so I felt it was best to stick with real arcade buttons designed to take the abuse. 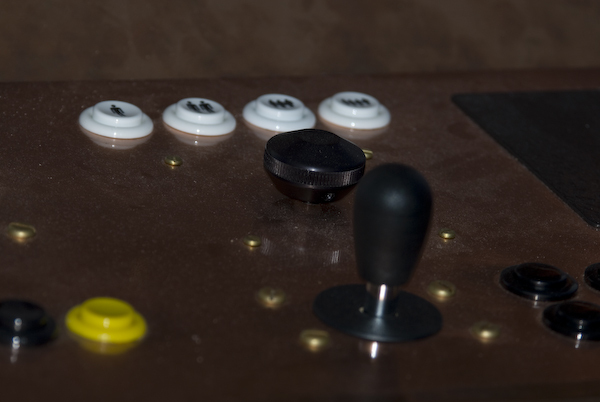 The control panel has controls for four players and also includes a track ball, spinner, and flight-stick for mimicking various specialized arcade games' controls (such as those used in Discs of Tron). In the upper left of this picture, it is just barely visible that there trim is missing on an edge. The two pictures that follow show the process of adding the trim. 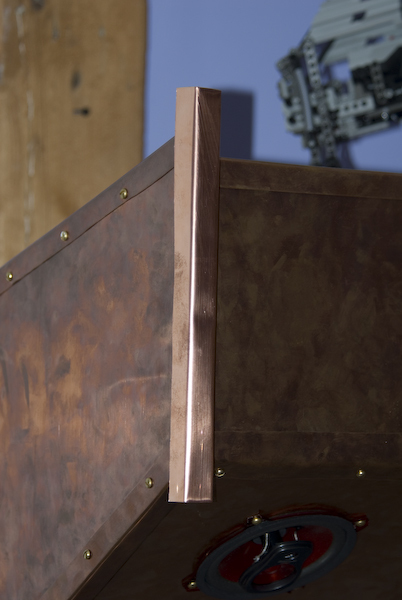 First, the copper strip is bend into a C-shape and fitted in place. Then, I use a metal scorer for scratching a mark so I know where to cut the proper angle and made the bend. This shows the piece now cut and bent into the proper shape and screwed in place with brass screws. Note how shiney and new the piece of trim is compared to the rest of the copper. This is because over two years have passed since I last worked on this project. Any copper that I handled previously has tarnished due the moisture from my hands reacting with the copper. These last two pictures show the completed machine. If all goes well, I'll be the owner of a new condo on May 4th. Since the sale of my current place is closing on May 15th, that'll give me 2 weekends of overlap when I'll actually own two condos at once. This will make the move a lot easier. The past few times I've moved over the years, I've found it easiest to just move a little bit at a time each day - packing my car in the morning before work and going to the new place at night and unpacking. I liken it to moving like an ant - carrying little pieces at a time, but eventually it all adds up. It also allows me to move most of my belongings myself, limiting the intrusion on friends to just a few larger items which I can't possibly carry by myself. And where am I going? I'll be leaving the scenic sea coast of North Kingstown for the slightly more urban setting of Woonsocket. The condo is in a historic brick mill building and will be the third condo I've owned in a converted old mill. I'm just a sucker for old mills, I guess. The big upside of the move is I'll be a LOT closer to where I spend most of my free time. I'll be just a mile from the Kodokai Dojo where I take karate classes. Currently I have at least a 45 minute drive. After the move I will actually be able to walk to and from class in less time than it would take me to drive just one way from North Kingstown to North Smithfield. Plus, the northern location is a lot closer to most of my friends, so I won't be dreading an hour long drive home late at night when visiting people. And, as an even more forward looking idea, if I ever need to change jobs, there are a lot more high-tech opportunities north of RI than there are in southern RI. And being 45 minutes further north means I'm that much closer to New Hampshire - a place where a couple friends of mine have migrated to and a state I greatly enjoy visiting for hiking. Of course I will miss the coast and the ever changing view of the wildlife in the cove, but I'm home so seldom it as it is lately that it won't be a big loss. I think I only went kayaking once or twice from my condo this past year. And if I want to kayak on the coast, I can always visit my parents. Hopefully they will be happy to see more of me. As for the commute to work, the drive time works out to be about the same (30 minutes); the only difference is I'll be driving south instead of north. Here's a thought provoking article about the significance of a recent accidental catching of a colossal squid by commercial fishing. http://news.bbc.co.uk/2/hi/science/nature/6549161.stm Courtesy of the BBC. The most surprising part of the article for me was the mention of how some fish that are being caught for food are over 150 years old. Here's some more info about those very old fish being over-fished. Since I'll be moving soon, today I spent the day wading through piles of papers as a Spring cleaning. When I first put my condo on the market back in July of last year, I had to make it look tidy and I quickly stowed papers in drawers and boxes. Over the months, each time I got a call from my real estate agent that another showing was scheduled, I would again stash papers out of view. Well, I must admit the amount of stashed papers has gotten quite large - I have spent the past 5 or 6 hours sorting through it all and I'm still not quite done! There were quite a few pleasant "aha!" discoveries of things I had forgotten. One of them was a journal from my trip to Okinawa. The thoughts that follow come from that misplaced journal. When Angie, Adain, and I were visiting Okinawa for three weeks last summer, we were attending classes at a Motobu-Ryu dojo during our stay. However, since back home we study a Shorin-Ryu style of karate, we really wanted to watch a traditional Shorin-Ryu style karate class in Okinawa. On the evening of July 3rd, 2006 we had the pleasure of meeting Zenpo Shimabukuru-Sensei at his Seibukan Shorin-Ryu dojo in Okinawa, Japan. We arrived at the Seibukan dojo shortly before the last children's class of the evening was about to begin. One of the adult green-belt students (an American woman) greeted us at the entrance to the dojo and inquired if we were interested in taking classes. We explained that we were only in Okinawa for a short time, but we would like to observe a class if it were possible. 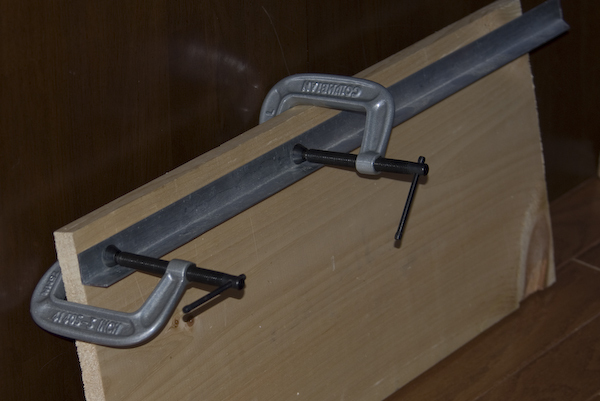 She said that would be able to do that and showed us to a bench set off to one side in the dojo. The class we watched appeared to be a white-belt through orange-belt children's class and was taught by Zenpo Shimabukuru-Sensei. It was very interesting to watch! Shimabukuru-Sensei was very strict with the children, not hesitating to forceably move a student into proper form when he felt it was needed. In one case, a student who was not bowing properly was given a slap to the back of the head and had his body pushed into the correct angle. The stories we had heard of traditional Okinawan karate teachers not being the "warm and fuzzy" type when teaching appeared to definitely be true - but the end results were noticable. The techniques and movements of the children - even the youngest of the group - was quite impressive, at least to my untrained eye. After the class, we were pleasantly surprised when Shimabukuru-Sensei came over to us and started up a conversation. We explained to him that we were visiting Okinawa for only a few weeks, hoping to see some traditional karate schools. It was already past 9:00 PM when the children's class ended and the dojo was closing for the night, yet Shimabukuru-Sensei spent the next two hours talking with us about his thoughts on traditional karate. It was a conversation that made the whole trip to Okinawa worth while for me. I wished I had a tape recorder with me - there was a wealth of information being said. Shimabukuru-Sensei spoke for the vast majority of the time while we sat and listened to his thoughts. He said he wanted our visit to Okinawa to be worthwhile, so he was happy to talk with us about what he thought was the true nature of karate and know who are real karateka-sensei. He explained that the main theme of karate is not fighting - karate is kata and bunkai (the application of kata) and strengthening spirit and body. He said karate can help in all sorts of situations in a person's life - if you lack confidence, karate will help, if you have a bad temper, karate will help, etc. He didn't have a tolerance for fighting. If a student was found to be fighting, that student would be thrown out. He was also proud of the fact that even though he has devoted his life to karate, he had never been in a fight. He mentioned how he was disappointed with the spread of sport karate and stressed that it is not karate. He also mentioned how he didn't like karate competitions and would not teach students who participated in competitions. He felt the competitions made the students who competed too proud and as a result those students were difficult to teach. Related to this, he mentioned how that he often found people who were switching styles to join his dojo became initially discouraged when they discovered first-hand that the "modern" form of karate that they had been previously practicing (sometimes for many years) was not real karate and wasn't truly effective. But he also added that often these students from other schools ended up being some of his best students as they had a better appreciation for what is real karate and what really works. He also spoke of the trouble with some people who are more concerned with rank rather than being happy with just practicing karate. A lot of the more modern schools give promotions too easily just to keep students. He gave the example of one of his students who has been with him 17 years and is "only" a 4th-dan. If a student appears to be more concerned with rank, he would prefer they leave his dojo. He also stressed the importance of training - training for years, often without explanation. He said that is how he learned. He gave as an example that no one taught him to use his hips, but from years of constant practice it became apparant how correct movement of the hips impart more power. He added that today people ask lots of questions rather than just "doing", so he feels he must be careful to fully understand the question so he can give a correct and thoughtful answer rather than just an answer. He also demonstrated the difference of performing a block without using much force and how it is ineffective, yet that is how people often practice. Instead, the block must always be practiced in such a way as to be able to stop a strong punch. It was startling how much of what he said coincided with what our sensei here at the Kodokai dojo has said regarding traditional karate. It was as if the two sensei had been talking to each other or Shimabukuru-Sensei had been reading our sensei's dojo web page over the years. It was uncanny and was a nice confirmation that our school is deeply rooted in traditional karate ways. There were so many points that Shimabukuru-sensei made during those two hours, it was hard to remember them all. He talked about how he opened a second dojo so his time was better spent. He wanted to practice karate 6 days a week, however he noticed when he had just one dojo that none of his students were there for all six days. So he asked them if they were interested in practicing for all six days. They all said they only wanted to practice at most 3 days a week. So he opened a second dojo elsewhere in Okinawa and each dojo is only open for three days. This way, the students can practice for the 3 days, but he gets to still gets to practice 6 days a week and gets to teach more students. One of the final points he made was how karate is his life and how those who are dedicated to karate should make sure they are doing things for their sensei. He said if someone really loves karate, they will do anything to help their sensei - going so far as to even sell their land or car to help the dojo. It was definitely an inspiring conversation and gave me lots of things to think about. I am very greatful that Shimabukuru-Sensei was willing to spend two hours talking with three American strangers who just wandered into his dojo one night. He was a very generous host! And as he said, karate is more than a job or hobby for himself - it is his life and he can get carried away when talking about it. Boy, someone sure needs a haircut! 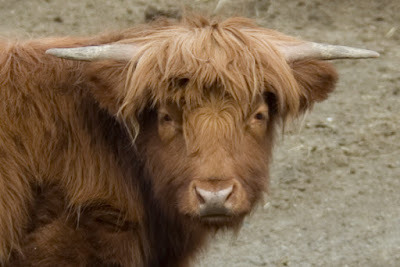 I went looking at houses today and this shaggy cow was the best I could come up with. It was hanging out on a farm near one of the houses I was interested in. Still no luck finding a place to live. I'm leaning towards the idea of a condo - I'd say I'm 65% pro condo right now.